There are two configuration files used by MapProxy. This is the main configuration of MapProxy. It configures all aspects of the server: Which servers should be started, where comes the data from, what should be cached, etc.. This file is the configuration for the mapproxy-seed tool. See seeding documentation for more information. The configuration uses the YAML format. The Wikipedia contains a good introduction to YAML. globals: Internals of MapProxy and default values that are used in the other configuration sections. services: The services MapProxy offers, e.g. WMS or TMS. sources: Define where MapProxy can retrieve new data. caches: Configure the internal caches. layers: Configure the layers that MapProxy offers. Each layer can consist of multiple sources and caches. grids: Define the grids that MapProxy uses to aligns cached images. The order of the sections is not important, so you can organize it your way. The indentation is significant and shall only contain space characters. Tabulators are not permitted for indentation. parts: YAML supports references and with that you can define configuration parts and use them in other configuration sections. For example, you can define all you coverages in one place and reference them from the sources. However, MapProxy will log a warning if you put the referent in a place where it is not a valid option. To prevent these warnings you are advised to put these configuration snippets inside the parts section. You can split a configuration into multiple files with the base option. The base option loads the other files and merges the loaded configuration dictionaries together – it is not a literal include of the other files. Changed in version 1.4.0: Support for recursive imports and for multiple files. Here you can configure which services should be started. The configuration for all services is described in the Services documentation. Here you can define all layers MapProxy should offer. The layer definition is similar to WMS: each layer can have a name and title and you can nest layers to build a layer tree. Each layer contains information about the layer and where the data comes from. The old syntax to configure each layer as a dictionary with the key as the name is deprecated. The mixed format where the layers are a list (-) but each layer is still a dictionary is no longer supported (e.g. - mylayer: becomes - name: mylayer). The name of the layer. You can omit the name for group layers (e.g. layers with layers), in this case the layer is not addressable in WMS and used only for grouping. Readable name of the layer, e.g WMS layer title. Each layer can contain another layers configuration. You can use this to build group layers and to build a nested layer tree. root and layer1 is a group layer in this case. The WMS service will render layer1a and layer1b if you request layer1. Note that sources is optional if you supply layers. You can still configure sources for group layers. In this case the group sources will replace the sources of the child layers. MapProxy will wrap all layers into an unnamed root layer, if you define multiple layers on the first level. The old syntax (see name above) is not supported if you use the nested layer configuration format. A list of data sources for this layer. You can use sources defined in the sources and caches section. MapProxy will merge multiple sources from left (bottom) to right (top). WMS and Mapserver sources also support tagged names (wms:lyr1,lyr2). See Tagged source names. A list of caches for this layer. This list overrides sources for WMTS and TMS. tile_sources are not merged like sources, instead all the caches are added as additional tile (matrix) sets. Limit the layer to the given min and max resolution or scale. MapProxy will return a blank image for requests outside of these boundaries (min_res is inclusive, max_res exclusive). You can use either the resolution or the scale values, missing values will be interpreted as unlimited . Resolutions should be in meters per pixel. The values will also apear in the capabilities documents (i.e. WMS ScaleHint and Min/MaxScaleDenominator). Pleas read scale vs. resolution for some notes on scale . Configure a URL to an image that should be returned as the legend for this layer. Local URLs (file://) are also supported. MapProxy ignores the legends from the sources of this layer if you configure a legendurl here. Add additional metadata for this layer. This metadata appears in the WMS 1.3.0 capabilities documents. Refer to the OGC 1.3.0 specification for a description of each option. See also INSPIRE View Service for configuring additional INSPIRE metadata. Dimensions are only supported for uncached WMTS services for now. See WMTS service with dimensions for a working use-case. Configure the dimensions that this layer supports. Dimensions should be a dictionary with one entry for each dimension. Each dimension is another dictionary with a list of values and an optional default value. When the default value is omitted, the last value will be used. A list of data sources for this cache. You can use sources defined in the sources and caches section. This parameter is required . MapProxy will merge multiple sources from left (bottom) to right (top) before they are stored on disk. You can also define a list of sources for each color band. The target color bands are specified as r, g, b for RGB images, optionally with a for the alpha band. You can also use l (luminance) to create tiles with a single color band (e.g. grayscale images). You need to define the source and the band index for each source band. The indices of the source bands are numeric and start from 0. You can also use other caches as a source. MapProxy loads tiles directly from that cache if the grid of the target cache is identical or compatible with the grid of the source cache. You have a compatible grid when all tiles in the cache grid are also available in source grid, even if the tile coordinates (X/Y/Z) are different. When the grids are not compatible, e.g. when they use different projections, then MapProxy will access the source cache as if it is a WMS source and it will use meta-requests and do image reprojection as necessary. See Using existing caches for more information. The internal image format for the cache. Available options are image/png, image/jpeg etc. and mixed. The default is image/png. MapProxy will try to use this format to request new tiles, if it is not set format is used. This option has no effect if the source does not support that format or the format of the source is set explicitly (see suported_format or format for sources). If set to true, MapProxy will not store tiles that only contain a single color as a separate file. MapProxy stores these tiles only once and uses symbolic links to this file for every occurrence. This can reduce the size of your tile cache if you have larger areas with no data (e.g. water areas, areas with no roads, etc.). This feature is only available on Unix, since Windows has no support for symbolic links. If set to true, MapProxy will only issue a single request to the source. This option can reduce the request latency for uncached areas (on demand caching). By default MapProxy requests all uncached meta-tiles that intersect the requested bbox. With a typical configuration it is not uncommon that a requests will trigger four requests each larger than 2000x2000 pixel. With the minimize_meta_requests option enabled, each request will trigger only one request to the source. That request will be aligned to the next tile boundaries and the tiles will be cached. Add a watermark right into the cached tiles. The watermark is thus also present in TMS or KML requests. The watermark text. Should be short. The opacity of the watermark (from 0 transparent to 255 full opaque). Use a value between 30 and 100 for unobtrusive watermarks. Font size of the watermark text. Color of the watermark text. Default is grey which works good for vector images. Can be either a list of color values ([255, 255, 255]) or a hex string (#ffffff). Configure the spacing between repeated watermarks. By default the watermark will be placed on every tile, with wide the watermark will be placed on every second tile. You can configure one or more grids for each cache. MapProxy will create one cache for each grid. MapProxy supports on-the-fly transformation of requests with different SRSs. So it is not required to add an extra cache for each supported SRS. For best performance only the SRS most requests are in should be used. There is some special handling for layers that need geographical and projected coordinate systems. For example, if you set one grid with EPSG:4326 and one with EPSG:3857 then all requests for projected SRS will access the EPSG:3857 cache and requests for geographical SRS will use EPSG:4326. Change the meta_size and meta_buffer of this cache. See global cache options for more details. Enables meta-tile handling for tiled sources. See global cache options for more details. See below for all image options. You can limit until which resolution MapProxy should cache data with these two options. Requests below the configured resolution or level will be passed to the underlying source and the results will not be stored. The resolution of use_direct_from_res should use the units of the first configured grid of this cache. This takes only effect when used in WMS services. If set to true, MapProxy will not store any tiles for this cache. MapProxy will re-request all required tiles for each incoming request, even if the there are matching tiles in the cache. See seed_only if you need an offline mode. Be careful when using a cache with disabled storage in tile services when the cache uses WMS sources with metatiling. Directory where MapProxy should store tiles for this cache. Uses the value of globals.cache.base_dir by default. MapProxy will store each cache in a subdirectory named after the cache and the grid SRS (e.g. cachename_EPSG1234). See directory option on how configure a complete path. Configure the type of the background tile cache. You configure the type with the type option. The default type is file and you can leave out the cache option if you want to use the file cache. Read Caches for a detailed list of all available cache backends. Here you can define the tile grids that MapProxy uses for the internal caching. There are multiple options to define the grid, but beware, not all are required at the same time and some combinations will result in ambiguous results. GLOBAL_WEBMERCATOR: similar to GLOBAL_MERCATOR but uses EPSG:3857 and origin north-west, compatible with OpenStreetMap/etc. Overwrite the name of the grid used in WMTS URLs. The name is also used in TMS and KML URLs when the use_grid_names option of the services is set to true. The spatial reference system used for the internal cache, written as EPSG:xxxx. The size of each tile. Defaults to 256x256 pixel. A list with all resolutions that MapProxy should cache. Here you can define a factor between each resolution. It should be either a number or the term sqrt2. sqrt2 is a shorthand for a resolution factor of 1.4142, the square root of two. With this factor the resolution doubles every second level. Compared to the default factor 2 you will get another cached level between all standard levels. This is suited for free zooming in vector-based layers where the results might look to blurry/pixelated in some resolutions. For requests with no matching cached resolution the next best resolution is used and MapProxy will transform the result. A list with resolutions at which MapProxy should switch from one level to another. MapProxy automatically tries to determine the optimal cache level for each request. You can tweak the behavior with the stretch_factor option (see below). If you need explicit transitions from one level to another at fixed resolutions, then you can use the threshold_res option to define these resolutions. You only need to define the explicit transitions. Requests with 1500, 1000 or 701m/px resolution will use the first level, requests with 700 or 500m/px will use the second level. All other transitions (between 500 an 200m/px in this case) will be calculated automatically with the stretch_factor (about 416m/px in this case with a default configuration). The extent of your grid. You can use either a list or a string with the lower left and upper right coordinates. You can set the SRS of the coordinates with the bbox_srs option. If that option is not set the srs of the grid will be used. MapProxy always expects your BBOX coordinates order to be west, south, east, north regardless of your SRS axis order. The SRS of the grid bbox. See above. The default origin (x=0, y=0) of the tile grid is the lower left corner, similar to TMS. WMTS defines the tile origin in the upper left corner. MapProxy can translate between services and caches with different tile origins, but there are some limitations for grids with custom BBOX and resolutions that are not of factor 2. You can only use one service in these cases and need to use the matching origin for that service. If the x=0, y=0 tile is in the lower-left/south-west corner of the tile grid. This is the default. If the x=0, y=0 tile is in the upper-left/north-west corner of the tile grid. The total number of cached resolution levels. Defaults to 20, except for grids with sqrt2 resolutions. This option has no effect when you set an explicit list of cache resolutions. The the resolutions of the first and the last level. MapProxy chooses the optimal cached level for requests that do not exactly match any cached resolution. MapProxy will stretch or shrink images to the requested resolution. The stretch_factor defines the maximum factor MapProxy is allowed to stretch images. Stretched images result in better performance but will look blurry when the value is to large (> 1.2). Example: Your MapProxy caches 10m and 5m resolutions. Requests with 9m resolution will be generated from the 10m level, requests for 8m from the 5m level. This factor only applies for the first level and defines the maximum factor that MapProxy will shrink images. Example: Your MapProxy layer starts with 1km resolution. Requests with 3km resolution will get a result, requests with 5km will get a blank response. With this option, you can base the grid on the options of another grid you already defined. There are multiple options that influence the resolutions MapProxy will use for caching: res, res_factor, min_res, max_res, num_levels and also bbox and tile_size. We describe the process MapProxy uses to build the list of all cache resolutions. If you supply a list with resolution values in res then MapProxy will use this list and will ignore all other options. If min_res is set then this value will be used for the first level, otherwise MapProxy will use the resolution that is needed for a single tile (tile_size) that contains the whole bbox. If you have max_res and num_levels: The resolutions will be distributed between min_res and max_res, both resolutions included. The resolutions will be logarithmical, so you will get a constant factor between each resolution. With resolutions from 1000 to 10 and 6 levels you would get 1000, 398, 158, 63, 25, 10 (rounded here for readability). If you have max_res and res_factor: The resolutions will be multiplied by res_factor until larger then max_res. If you have num_levels and res_factor: The resolutions will be multiplied by res_factor for up to num_levels levels. A sources defines where MapProxy can request new data. Each source has a type and all other options are dependent to this type. See Sources for the documentation of all available sources. Here you can define some internals of MapProxy and default values that are used in the other configuration directives. Here you can define some options that affect the way MapProxy generates image results. The resampling method used when results need to be rescaled or transformed. You can use one of nearest, bilinear or bicubic. Nearest is the fastest and bicubic the slowest. The results will look best with bilinear or bicubic. Bicubic enhances the contrast at edges and should be used for vector images. With bilinear you should get about 2/3 of the nearest performance, with bicubic 1/3. Enable paletted (8bit) PNG images. It defaults to true for backwards compatibility. You should set this to false if you need 24bit PNG files. You can enable 8bit PNGs for single caches with a custom format (colors: 256). Modify existing or define new image formats. See below for all image format options. The following options define how tiles are created and stored. Most options can be set individually for each cache as well. MapProxy does not make a single request for every tile it needs, but it will request a large meta-tile that consist of multiple tiles. meta_size defines how large a meta-tile is. A meta_size of [4, 4] will request 16 tiles in one pass. With a tile size of 256x256 this will result in 1024x1024 requests to the source. Tiled sources are still requested tile by tile, but you can configure MapProxy to load multiple tiles in bulk with bulk_meta_tiles . Enables meta-tile handling for caches with tile sources. If set to true , MapProxy will request neighboring tiles from the source even if only one tile is requested from the cache. meta_size defines how many tiles should be requested in one step and concurrent_tile_creators defines how many requests are made in parallel. This option improves the performance for caches that allow to store multiple tiles with one request, like SQLite/MBTiles but not the file cache. MapProxy will increase the size of each meta-tile request by this number of pixels in each direction. This can solve cases where labels are cut-off at the edge of tiles. The base directory where all cached tiles will be stored. The path can either be absolute (e.g. /var/mapproxy/cache) or relative to the mapproxy.yaml file. Defaults to ./cache_data. MapProxy uses locking to limit multiple request to the same service. See concurrent_requests. This option defines where the temporary lock files will be stored. The path can either be absolute (e.g. /tmp/lock/mapproxy) or relative to the mapproxy.yaml file. Defaults to ./cache_data/tile_locks. MapProxy uses locking to prevent that the same tile gets created multiple times. This option defines where the temporary lock files will be stored. The path can either be absolute (e.g. /tmp/lock/mapproxy) or relative to the mapproxy.yaml file. Defaults to ./cache_data/dir_of_the_cache/tile_locks. This limits the number of parallel requests MapProxy will make to a source. This limit is per request for this cache and not for all MapProxy requests. To limit the requests MapProxy makes to a single server use the concurrent_requests option. Example: A request in an uncached region requires MapProxy to fetch four meta-tiles. A concurrent_tile_creators value of two allows MapProxy to make two requests to the source WMS request in parallel. The splitting of the meta-tile and the encoding of the new tiles will happen in parallel to. Enables the link_single_color_images option for all caches if set to true. See link_single_color_images. Maximum number of tiles MapProxy will merge together for a WMS request. This limit is for each layer and defaults to 500 tiles. MapProxy uses Proj4 for all coordinate transformations. If you need custom projections or need to tweak existing definitions (e.g. add towgs parameter set) you can point MapProxy to your own set of proj4 init files. The path should contain an epsg file with the EPSG definitions. The configured path can be absolute or relative to the mapproxy.yaml. The axis ordering defines in which order coordinates are given, i.e. lon/lat or lat/lon. The ordering is dependent to the SRS. Most clients and servers did not respected the ordering and everyone used lon/lat ordering. With the WMS 1.3.0 specification the OGC emphasized that the axis ordering of the SRS should be used. Here you can define the axis ordering of your SRS. This might be required for proper WMS 1.3.0 support if you use any SRS that is not in the default configuration. By default MapProxy assumes lat/long (north/east) order for all geographic and x/y (east/north) order for all projected SRS. If you need to override one of the default values, then you need to define both axis order options, even if one is empty. MapProxy supports access to HTTPS servers. Just use https instead of http when defining the URL of a source. MapProxy verifies the SSL/TLS connections against your systems “certification authority” (CA) certificates. You can provide your own set of root certificates with the ssl_ca_certs option. See the Python SSL documentation for more information about the format. New in version 1.11.0: MapProxy uses the systems CA files by default, if you use Python >=2.7.9 or >=3.4. You need to supply a CA file that includes the root certificates if you use older MapProxy or older Python versions. Otherwise MapProxy will fail to establish the connection. You can set the http.ssl_no_cert_checks options to true to disable this verification. If you want to use SSL/TLS but do not need certificate verification, then you can disable it with the ssl_no_cert_checks option. You can also disable this check on a source level. This defines how long MapProxy should wait for data from source servers. Increase this value if your source servers are slower. Configure which HTTP method should be used for HTTP requests. By default ( AUTO ) MapProxy will use GET for most requests, except for requests with a long query string (e.g. WMS requests with sld_body ) where POST is used instead. You can disable this behavior with either GET or POST . Add additional HTTP headers to all requests to your sources. Sets the Access-control-allow-origin header to HTTP responses for Cross-origin resource sharing. This header is required for WebGL or Canvas web clients. Defaults to * . Leave empty to disable the header. This option is only available in globals . Configuration options for the TMS/Tile service. The number of hours a Tile is valid. TMS clients like web browsers will cache the tile for this time. Clients will try to refresh the tiles after that time. MapProxy supports the ETag and Last-Modified headers and will respond with the appropriate HTTP ‘304 Not modified’ response if the tile was not changed. Options for the Mapserver source. The complete path to the mapserv executable. Required if you use the mapserver source. Path where the Mapserver should be executed from. It should be the directory where any relative paths in your mapfile are based on. Defaults to the directory of binary. There are a few options that affect how MapProxy encodes and transforms images. You can set these options in the globals section or individually for each source or cache. The mime-type of this image format. The format defaults to the name of the image configuration. One of RGB for 24bit images, RGBA 32bit images with alpha, P for paletted images or I for integer images. The number of colors to reduce the image before encoding. Use 0 to disable color reduction (quantizing) for this format and 256 for paletted images. See also globals.image.paletted. true if the image should have an alpha channel. The resampling method used for scaling or reprojection. One of nearest, bilinear or bicubic. Options that modify the way MapProxy encodes (saves) images. These options are format dependent. See below. Configures the opacity of a layer or cache. This value is used when the source or cache is placed on other layers and it can be used to overlay non-transparent images. It does not alter the image itself, and only effects when multiple layers are merged to one image. The value should be between 0.0 (full transparent) and 1.0 (opaque, i.e. the layers below will not be rendered). An integer value from 0 to 100 that defines the image quality of JPEG images. Larger values result in slower performance, larger file sizes but better image quality. You should try values between 75 and 90 for good compromise between performance and quality. The algorithm used to quantize (reduce) the image colors. Quantizing is used for GIF and paletted PNG images. Available quantizers are mediancut and fastoctree. fastoctree is much faster and also supports 8bit PNG with full alpha support, but the image quality can be better with mediancut in some cases. The quantizing is done by the Python Image Library (PIL). fastoctree is a new quantizer that is only available in Pillow >=2.0. See installation of PIL. You can configure image formats globally with the image.formats option. Each format has a name and one or more options from the list above. You can choose any name, but you need to specify a format if the name is not a valid mime-type (e.g. myformat instead of image/png). MapProxy will use your image formats when you are using the format name as the format of any source or cache. Scale is the ratio of a distance on a map and the corresponding distance on the ground. This implies that the map distance and the ground distance are measured in the same unit. 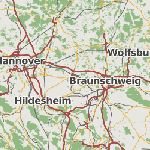 For MapProxy a map is just a collection of pixels and the pixels do not have any size/dimension. They do correspond to a ground size but the size on the map is depended of the physical output format. MapProxy can thus only work with resolutions (pixel per ground unit) and not scales. This applies to all servers and the OGC WMS standard as well. Some neglect this fact and assume a fixed pixel dimension (like 72dpi), the OCG WMS 1.3.0 standard uses a pixel size of 0.28 mm/px (around 91dpi). But you need to understand that a scale will differ if you print a map (200, 300 or more dpi) or if you show it on a computer display (typical 90-120 dpi, but there are mobile devices with more than 300 dpi). You can convert between scales and resolutions with the mapproxy-util scales tool. MapProxy will use the OCG value (0.28mm/px) if it’s necessary to use a scale value (e.g. MinScaleDenominator in WMS 1.3.0 capabilities), but you should always use resolutions within MapProxy. The WMS ScaleHint is a bit misleading. The parameter is not a scale but the diagonal pixel resolution. It also defines the min as the minimum value not the minimum resolution (e.g. 10m/px is a lower resolution than 5m/px, but 5m/px is the minimum value). MapProxy always uses the term resolutions as the side length in ground units per pixel and minimum resolution is always the higher number (100m/px < 10m/px). Keep that in mind when you use these values.